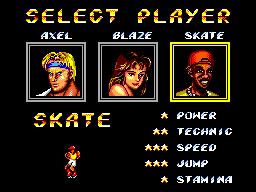 The Sega Master System games received some excellent beat-em-up titles. 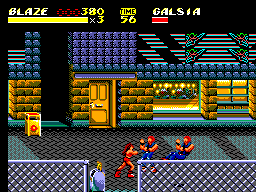 Among them is Streets of Rage 2, which is a successful Mega Drive game also made beautifully for SMS. 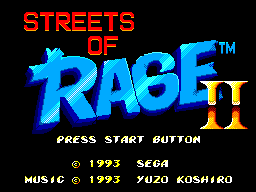 The SMS version was the last made and all 'Streets of Rage 2' versions for Mega Drive, Game Gear and Sega Master System are different among themselves. There are some stages between SMS and GG versions that have never been seen before! The gameplay is great and enriching. As said above, you can walk about new and nice stages but if you are not patient, you get angry due to the extreme difficulty. Even if you choose an easy option and the fact you bash in just 2 enemies each screen, you will not easily finish this one! The graphics are excellent, like all other beat-em-ups in SMS the library! The sprites are bit small if you compare the first SoR game on SMS, but even so, are excellent and detailed as the size allows. What can I say about the soundtrack? MAGNIFICENT! Yuzo Koshiro has done well with 16 and 8 bits sound/music and knows how use the PSG sound/music capability very well for the Sega Master System! If there's one thing I really enjoy, it's the controls. Most of combo attacks are present and some are even different compared to the Mega Drive/Game Gear versions. I really like that each enemy needs a different tactical combat to attack and defeat them (unless you try to fight them in their own way and be lucky to not to lose many lives). I also want to highlight that the quick speed your hero and enemies move/attack builds a lot of adrenaline! I have still not finished this one and just need the SMS versions of SoR games to beat. When it happens though, I will certainly replay them at some point during my life! Despite this version of the game for SMS being harshly criticized and underrated for the fans who prefer the Mega Drive and Game Gear versions, many games magazines praised this version with quotes such as 'The best of SMS genre' and 'One of the best SMS Beat em ups'. I really think these negative reviews by fans are baloney! Sega Enterprises of Japan made an excellent job for the SMS and deserves my applause!